Samsung has introduced Galaxy M series in smartphone industry with aim to recover its market over Chinese smartphone manufacturers. Through this new series, the company is actually planning to target midrange and entry-level segment. In order to do so, Samsung Galaxy M20 seems but better option with better price tag as compared to previous mid-range devices from Samsung. Looking through its specs and design, M20 can be a good alternative to other affordable Chinese smartphones availaing in market. 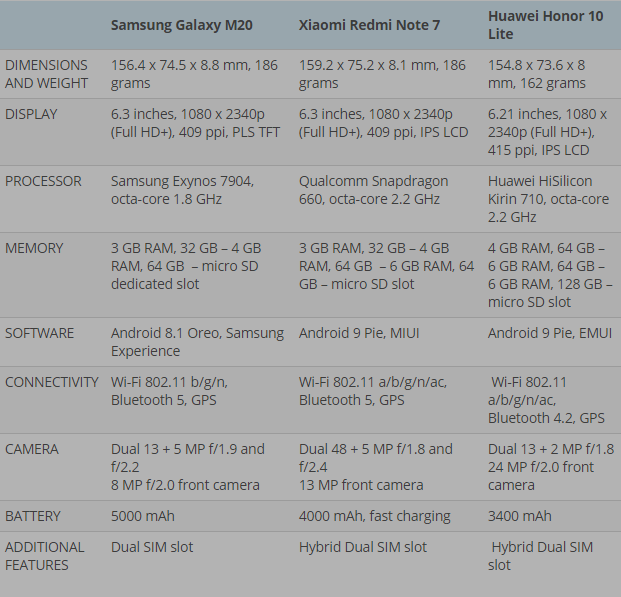 So, considering the price tag of M20, here we go doing comparison between Samsung Galaxy M20 vs Xiaomi Redmi Note 7 vs Honor 10 Lite, all these phone probably lies in midrange budget. Taking design aspects into mind, Samsung Galaxy M20 is still behind in compare to other two phones because the other two phones have better design availability. Speaking about Honor 10 Lite, it has the best design and unique look. It basically comes with a very small dewdrop notch and stunning rear made of glass which is also available in gradient hues. Talking about Redmi Note 7, it has a lesser screen to body ratio that makes it look less attractive however the build quality is better indeed. Part from these, Note 7 even comes packed with Gorilla Glass 5 protection along with water resistance features. In the aspect of display, Xiaomi Redmi Note 7 is leading in the list. The reason is its small notch and a bigger diagonal in compare to other two smartphones. Although, the M20 sports PLS TFT technology but it seems not much convincing because the users nowadays prefer IPS displays. Although, Note 7 is the winner in the race of display related aspects, but a user should not choose it in mid-range devices if they consider display as the most important thing. while considering Samsung Galaxy M20 vs Xiaomi Redmi Note 7 vs Honor 10 Lite in aspect of specs and software, the Note 7 and Honor 10 Lite have better hardware department. Kirin 710 chipset might be able to offer great performance in regular and everyday uses, however the Snapdragon 660 is still better and more powerful when it comes to graphics related app usage. Considering this point, the Honor 10 Lite seems the winner with most expensive configuration and also comes packed with 128GB or ROM. Taking out the box software comparison, Xiaomi Note 7 and Honor 10 Lite sports Android Pie, whereas M20 is still running Oreo. Coming to camera specs, Samsung Galaxy M20 comes to second position whereas the third buts till superior in selfie camera ranking goes to Honor 10 Lite. This device actually equips a 24MP with AI-backed features. However, Redmi Note 7 is leading at all with great 48MP rear camera specs. One would surely choose this phone if the main consideration is camera in smartphone. When it come to smartphone usage for high duration, batter is the strongest point. At this point, Samsung Galaxy M20 can probably last for 2 days as it sports a massive 5000mAh li-ion battery. However, the Note 7 seems an incredible device with 4000mAh battery configuration, however the Honor 10 Lite is average in this aspect. Users can get Xiaomi Redmi Note 7 or Galaxy M20 for $150 and $171 respectively, however the Honor 10 Lite is a bit costlier with $240 price tag. In the overall comparison between Samsung Galaxy M20 vs Xiaomi Redmi Note 7 vs Honor 10 Lite, Note 7 is actually the winner with great balance of all specs, camera, performance and other aspects as well. 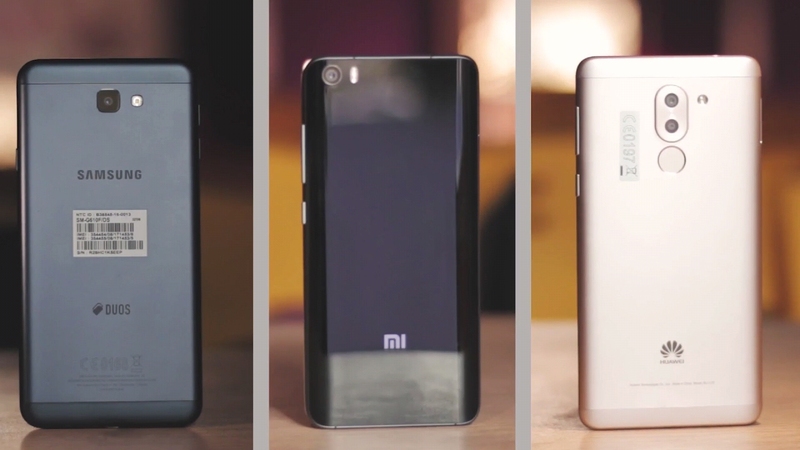 Hope you liked our comparison between aforesaid midrange smartphones. Subscribe Us for more similar comparisons and technical news.